Die Veneris, 6 Julii, 1649. ORDERED, That Wednesday next, being the Eleventh Day of July instant, be set apart, and appointed, for a Day of Publick and Solemn Fasting and Humiliation, to be observed in all Churches and Chapels within the Cities of London and Westminster, and the late Lines of Communication, and weekly Bills of Mortality, for the Seeking of Almighty God, for his especial Blessing upon the Forces now designed and going for the Relief of Ireland; And that the Lord Mayor of the City of London be required to cause timely Notice hereof to be given to the Ministers of the several Parish Churches within the City of London, and Liberties thereof; and to take care the same be duly observed accordingly: And that every of the Ministers of the Churches aforesaid be required to publish this Order, in the several Churches, on the next Lord's Day. Ordered, That Mr. Strong be desired to preach before the House, at Margaret's, Westminster, on Wednesday next, being set apart for a Day of Publick Fasting and Humiliation. Ordered, That Mr. Allen do give Mr. Strong Notice hereof. Ordered, That Mr. Bond be desired to preach before the House, at Margaret's, Westminster, on Wednesday next, being set apart for a Day of Publick Fasting and Humiliation. Ordered, That Mr. Gurdon do give Mr. Bond Notice hereof. Ordered, That Mr. Caryll be desired to preach before the House, at Margaret's, Westminster, on Wednesday next, being set apart for a Day of Publick Fasting and Humiliation. Ordered, That Mr. Love do give Notice hereof to Mr. Caryll. Ordered, That Wednesday-next-come-three-weeks be set apart, and appointed, for a Day of Publick Fasting and Humiliation, for seeking unto Almighty God, in an especial manner, for his Blessing upon the Forces designed and now going for the Relief of Ireland, to be observed in all Cities, Towns, and Places, in England and Wales, besides the Cities of London and Westminster: And that the Sheriffs of the several Counties in England and Wales do take care to disperse this Order unto the Ministers of the several Churches aforesaid: And the Justices of Peace in the several Counties are required to take care for the due Observation thereof: And that the Ministers do publish this Order in their several Churches, on the Lord's Day next before the Day appointed for the due Observation of the said Fast. Ordered, That Mr. Moyle the elder be admitted into the House. Ordered, That the Report touching the late King's Servants be made on Tuesday next, next after the Act for New England. Ordered, That the Lord Albert Joachimi, Ambassador for the Lords the States General of the United Provinces, have Liberty to transport Four Horses into the United Provinces, for the Baron of Scomburgh, Custom and Impost free. A Letter from the General, from Queen-street, the Second of July, 1649, touching Courts of Judicature to be settled in Yorksheire; the humble Petition and Desires of the Inhabitants of Yorksheire, and the City and County of the City of York, presented by their several Grand Juries, their Representees, now met at the Assizes there, the Nineteenth of March 1648; were both this Day read. Ordered, That the said Petition be committed unto Sir Thomas Widdrington, Sir Henry Vane senior, Mr. Love, Colonel Venn, Mr. Oldsworth, Mr. Bond, Sir Wm. Allanson, Sir Peter Wentworth, Mr. Moyle, Mr. Gurdon, Sir Wm. Strickland, Sir William Brewerton, Mr. Peirpoynt, Mr. Weaver, all the Lawyers of the House, Mr. Myles Corbett, Mr. Say, Mr. Goodwyn, Mr. Skynner, Mr. Leman, Mr. Attorney General, Colonel Lassels, Mr. Pury, Mr. Garland, Mr. Darlee, Mr. Trenchard, Mr. Blagrave, Mr. Hallowes, the Lords Commissioners for the Great Seal, Mr. Weston, Mr. Dove, Mr. Compton, Mr. Aldworth, Lord Munson, Major Salway, Sir John Trevor: And all that come to have Voices: And the said Committee are to meet To-morrow in the Afternoon, in the Exchequer Chamber; and so de die in diem: And the said Committee are to consider of this Petition; and offer such Heads to this House, in order to this Petition, or otherwise, as they shall think sit, for the Good of this Commonwealth. An Act for altering the Seals of the Court of the Duchy Chamber of Lancaster at Westminster, and of the County Palatine of Lancaster, was this Day read the First and Second time; and, upon the Question, committed unto Sir Tho. Widdrington, Sir Hen. Vane senior, Mr. Love, Mr. Myles Corbett, Major General Skippon, Mr. Goodwyn: Who are forthwith to withdraw; and pen the said Act, according to the Debate now had in this House: With a Proviso, That this Act continue until the Eighth Day of December next, and no longer. Resolved, &c. That the Lord President of the Council of State have the Custody of the Duchy Seal, until the Eighth Day of December next. Ordered, That Mr. Attorney General be required to prepare and bring in an Act for Restraint of the Transportation of Horses beyond Sea, and imposing a Penalty on such Persons as shall offend therein. Mr. Love reports from the Committee of Revenue, That Mr. Fowke and Mr. Aluered are agreed concerning the Receivership of Yorkshire: And that the Agreement is, That Colonel Aluered shall execute the Place; and that a Warrant may issue to Mr. Attorney, to draw up a Patent, for Colonel Aluered to be Receiver there; and the Lords Commissioners for the Great Seal of England be authorized and required to pass the same under the Great Seal accordingly. Ordered, That Mr. Attorney General do prosecute the bringing in the Six thousand Pounds Arrears, due from Mr. Bland, as Receiver of Yorkshire, according to the Directions of the Committee of the Revenue: And that he do also prepare a Patent to be passed to Colonel Aluered to be Receiver there. Mr. Attorney General reports an Act touching the Monies and Coins of England. Which was read the First and Second time; and, upon the Question, committed to the Committee of the Mint; and to Mr. Allen, Mr. Edw. Ash, Mr. Bond, Mr. Weaver, Mr. Gurdon, Mr. Boone, Mr. Hallowes, Mr. Myles Corbett, Mr. Leman, Mr. Gold, Mr. Attorney General, Mr. Trenchard, Mr. Say, Mr. Pelham, Alderman Wilson, Mr. Garland, Mr. Challoner, Mr. Scott; or any Five of them: And they are to meet, in the Queen's Court, To-morrow in the Afternoon; and so de die in diem: And Mr. Attorney General is to take care thereof. Mr. Attorney General reports an Act declaring it High Treason to counterfeit, clip, &c. the Money and Coin of England. Which was read the First and Second time; and, upon the Question, committed to the same Committee. 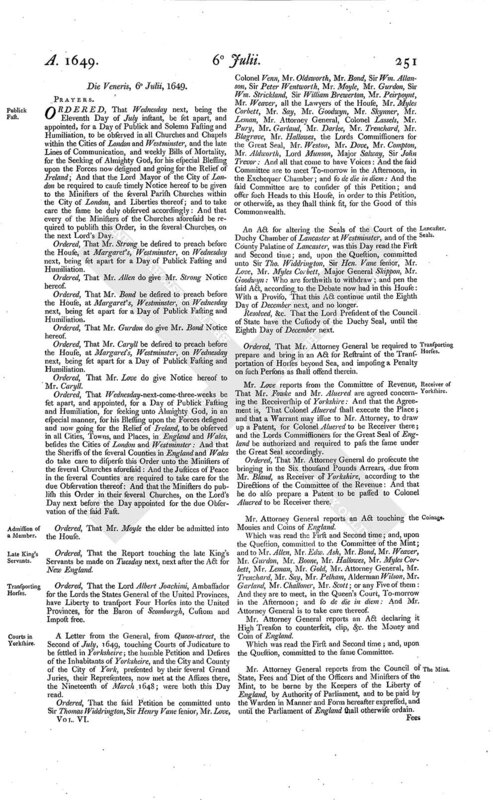 Mr. Attorney General reports from the Council of State, Fees and Diet of the Officers and Ministers of the Mint, to be borne by the Keepers of the Liberty of England, by Authority of Parliament, and to be paid by the Warden in Manner and Form hereafter expressed, and until the Parliament of England shall otherwise ordain. Fees and Diets of the Officers and Ministers of the Mint, to be borne by the Keepers of the Liberties of England, by Authority of Parliament; and to be paid by the Warden, in Manner and Form hereafter expressed; and until the Parliament of England shall otherwise ordain. No more to be allowed to the said Diet, but such as shall be admitted by the Matter, Warden, and Comptroller of the Mint; and their Names to be set down in Writing, within One Month after the Sealing of these Presents: And the Residue of the Charges for and about the Making of the Monies, and for all other Fees, are, from time to time, to be paid and borne by the Master and Worker of the Monies, upon Account, according to the Tenor and true Meaning of the Indenture hereunto annexed. Resolved, &c. That this House doth approve of the several Allowances. Resolved, &c. That this House doth approve of the several Persons, above named, to be in the several Places and Offices abovesaid. Ordered, That it be referred to the Council of State, to consider of the Claim of the several Persons above named, and every of them, in and to the Places aforesaid: And, in case there be any held by ancient Patents, that they do give Order for the Renewing of such Patents: And that their Order shall be a Warrant to Mr. Attorney General, to prepare such Patents to be granted: And that the Lords Commissioners for the Great Seal be authorized and required to pass such Patent in common Form, under the Great Seal of England, unto such Person accordingly: And that the Council of State do take Order, That such of the said Persons as they shall find requisite to put in Security for the due Execution of their Places, do put in Security accordingly. Mr. Attorney reports from the Council of State, an Order for a Warrant to the Attorney General to prepare a Bill, containing a Grant of the Office of Master Worker of the Money of England, within the Tower of London, &c. unto Aaron Geurdain. 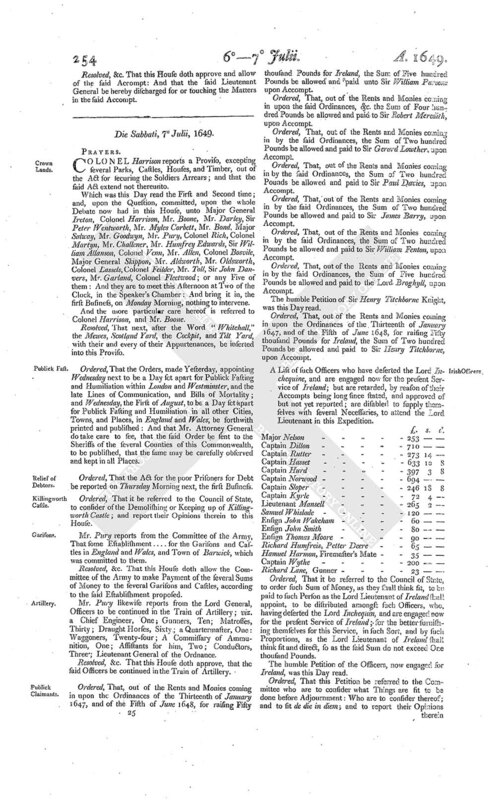 It was Ordered, by the Commons, assembled in Parliament, That Edmund Prideaux Esquire, Attorney General for the Commonwealth, do prepare a Bill, containing a Grant of the Office of Master Worker of the Monies of England, within the Tower of London, and elsewhere in England, unto Aaron Geurdain, Doctor of Physick; together with all Mansions and Buildings, Profits and Pre-eminences, to the said Office belonging, as amply as Sir Robert Harley, or any other heretofore, held the same; to hold and execute the same Office by himself, or his sufficient Deputy, for whom he will answer, until the Parliament of England shall otherwise ordain, according to the Form of an Indenture made between the Keepers of the Liberty of England, by Authority of Parliament, and the said Master Worker, to bear date with the Grant of the said Office, touching the Business of the Mint: Which said Indenture, having been perfected by the Council of State, to whom it was referred by the Parliament to be made perfect, is likewise to be, together with the Grant of the said Office, prepared in usual Form by the said Attorney General; and, after the Recepimus thereunto made by the Lords Commissioners for the Great Seal, and the Counterpart thereof signed and sealed by the said Master Worker, is, with the Schedule thereunto annexed, containing the several Officers of the Mint, and their several Fees and Allowances, to be forthwith passed, under the said Great Seal; as likewise the Grant of the said Office: For doing whereof this Order shall be, as well to the said Attorney General, as to the said Lords Commissioners, a sufficient Warrant. 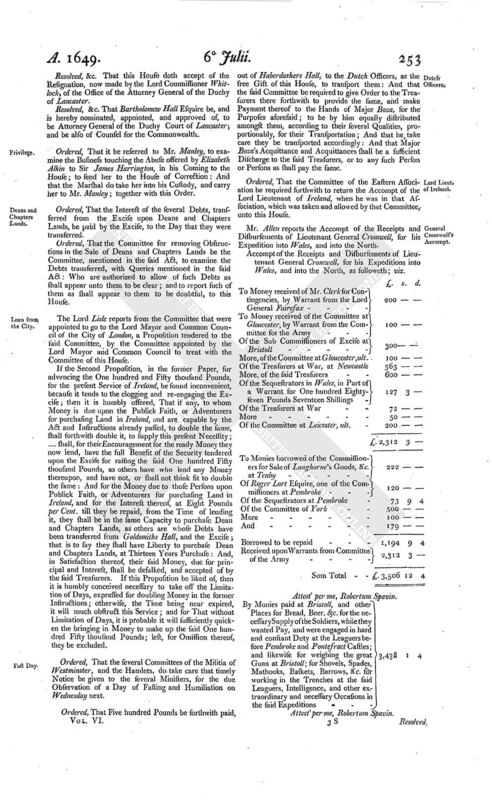 Ordered, That the Committee of the Army be authorized and required to give Instructions to the Committee of Accompts, at Worcester House, as to the Accompts of the Officers and Soldiers of this present Army; to proceed therein, by deducting the Proportion for Free Quarter only out of the present Pay, and not out of that which is respited upon the Publick Faith, in such sort as hath been formerly done by the Committee of the Army and Treasurers at Wars, in those by them passed; which this House doth approve of: And that the Commissioners at Worcester House do pass their Accompts accordingly. The Lord Commissioner Whitlock did this Day come into this House; and voluntarily resign the Office of the Attorney General of the Duchy of Lancaster, formerly conferred on his Lordship; and made it his humble Suit to this House, to dispose thereof, and confer the same, upon some other Person. Resolved, &c. That this House doth accept of the Resignation, now made by the Lord Commissioner Whitlock, of the Office of the Attorney General of the Duchy of Lancaster. Resolved, &c. That Bartholomew Hall Esquire be, and is hereby nominated, appointed, and approved of, to be Attorney General of the Duchy Court of Lancaster; and be also of Counsel for the Commonwealth. Ordered, That it be referred to Mr. Manley, to examine the Business touching the Abuse offered by Elizabeth Alkin to Sir James Harrington, in his Coming to the House; to send her to the House of Correction: And that the Marshal do take her into his Custody, and carry her to Mr. Manley; together with this Order. Ordered, That the Interest of the several Debts, transferred from the Excise upon Deans and Chapters Lands, be paid by the Excise, to the Day that they were transferred. Ordered, That the Committee for removing Obstructions in the Sale of Deans and Chapters Lands be the Committee, mentioned in the said Act, to examine the Debts transferred, with Queries mentioned in the said Act: Who are authorized to allow of such Debts as shall appear unto them to be clear; and to report such of them as shall appear to them to be doubtful, to this House. The Lord Lisle reports from the Committee that were appointed to go to the Lord Mayor and Common Council of the City of London, a Proposition tendered to the said Committee, by the Committee appointed by the Lord Mayor and Common Council to treat with the Committee of this House. If the Second Proposition, in the former Paper, for advancing the One hundred and Fifty thousand Pounds, for the present Service of Ireland, be found inconvenient, because it tends to the clogging and re-engaging the Excise; then it is humbly offered, That if any, to whom Money is due upon the Publick Faith, or Adventurers for purchasing Land in Ireland, and are capable by the Act and Instructions already passed, to double the same, shall forthwith double it, to supply this present Necessity; . . . . shall, for their Encouragement for the ready Money they now lend, have the full Benefit of the Security tendered upon the Excise for raising the said One hundred Fifty thousand Pounds, as others have who lend any Money thereupon, and have not, or shall not think fit to double the same: And for the Money due to those Persons upon Publick Faith, or Adventurers for purchasing Land in Ireland, and for the Interest thereof, at Eight Pounds per Cent. till they be repaid, from the Time of lending it, they shall be in the same Capacity to purchase Dean and Chapters Lands, as others are whose Debts have been transferred from Goldsmiths Hall, and the Excise; that is to say they shall have Liberty to purchase Dean and Chapters Lands, at Thirteen Years Purchase: And, in Satisfaction thereof, their said Money, due for principal and Interest, shall be defalked, and accepted of by the said Treasurers. If this Proposition be liked of, then it is humbly conceived necessary to take off the Limitation of Days, expressed for doubling Money in the former Instructions; otherwise, the Time being near expired, it will much obstruct this Service; and for That without Limitation of Days, it is probable it will sufficiently quicken the bringing in Money to make up the said One hundred Fifty thousand Pounds; lest, for Omission thereof, they be excluded. Ordered, That the several Committees of the Militia of Westminster, and the Hamlets, do take care that timely Notice be given to the several Ministers, for the due Observation of a Day of Fasting and Humiliation on Wednesday next. Ordered, That Five hundred Pounds be forthwith paid, out of Haberdashers Hall, to the Dutch Officers, as the free Gift of this House, to transport them: And that the said Committee be required to give Order to the Treasurers there forthwith to provide the same, and make Payment thereof to the Hands of Major Boza, for the Purposes aforesaid; to be by him equally distributed amongst them, according to their several Qualities, proportionably, for their Transportation; And that he, take care they be transported accordingly: And that Major Boza's Acquittance and Acquittances shall be a sufficient Discharge to the said Treasurers, or to any such Person or Persons as shall pay the same. Ordered, That the Committee of the Eastern Association be required forthwith to return the Accompt of the Lord Lieutenant of Ireland, when he was in that Association, which was taken and allowed by that Committee, unto this House. Mr. Allen reports the Accompt of the Receipts and Disbursements of Lieutenant General Cromwell, for his Expedition into Wales, and into the North. 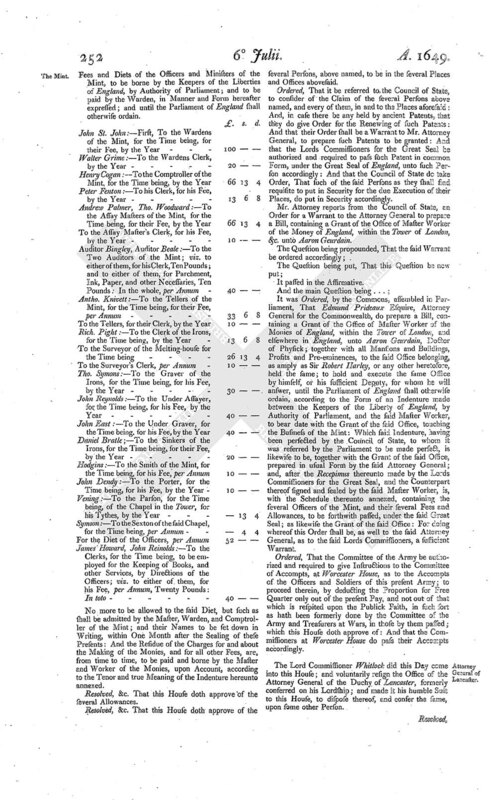 Accompt of the Receipts and Disbursements of Lieutenant General Cromwell, for his Expeditions into Wales, and into the North, as followeth; viz. Attest' per me, Robertum Spavin. Resolved, &c. That this House doth approve and allow of the said Accompt: And that the said Lieutenant General be hereby discharged for or touching the Matters in the said Accompt.